For the past 6 weeks I and the several hundred other ambulatory physicians who belong to the St. Luke’s Medical Group have been going through a difficult transition; we’ve changed the software that we use to manage patient information. Seven years ago we made the painful transition from paper patient charts to an electronic health record (EHR) called eClinical Works. This process required lots of scanning but by 2015 when i wrote “I Absolutely Love and Abhor My EMR” I had become very facile and comfortable with the software. During this current transition to an EHR called Cerner, we had to drastically reduce the number of patients seen per day in the office as we learned how to streamline workflow and as bugs were worked out of the system. We have struggled mightily with the simplest of tasks such as renewing patient prescriptions, scheduling tests, or reviewing test results. Stress levels for everyone, assistants to physicians, went through the roof as we spent hours clicking, refreshing, and re-entering data ion our frequently crashing computers. My apologies to all the patients that had to be rescheduled during this process and to any who had to wait excessively for something as simple as a follow up appointment. The bugs aren’t completely out but we are making progress. And my apologies to readers of the skeptical cardiologist as this EHR transition plus other work and social demands have left me no time to write. Prior to our Cerner transition I was in a good relationship with my various Mac laptops but for the last 6 weeks interacting with the EHR has made me a stressed, anxious and borderline depressed physician. The first 6 months of any EHR transition are by far the most difficult as all users gain proficiency with the workflow and as most patients are newly entering the system. Hopefully, 6 months from now the computer will not be my master and I and my staff will not be burned out. 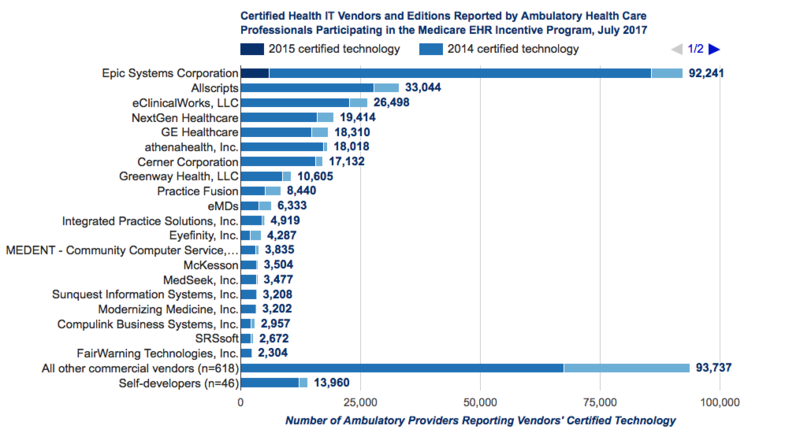 *Epic is the most widely used EHR by ambulatory physicians. Gawande makes the claim that “more than half of Americans have their health information in the Epic system. ” This graph indicates Epic is definitely the market leader but seems to have less than 50% of patients. Do Medical IDs Save Lives? The skeptical cardiologist recently received a package from American Medical ID, which loudly proclaimed that “Medical IDs Save lives!” The company suggested that I “Fully Open” my display and place it in a prominent location. I really don’t like promoting products in the office waiting room that haven’t been proven to be helpful, so I began wondering if medical IDs really do save lives. American Medical is one of many for-profit medical ID jewelry makers who engrave various forms of jewelry with the medical information a patient gives them, with the hope that it will provide crucial information if the patient is unable to provide it themselves. is a non-profit, charitable, and membership-based organization dedicated to the well being of others. Founded in 1956 by Dr. Marion and Chrissie Collins, the foundation’s mission is to protect and save lives by serving as the global information link between members and emergency responders during medical emergencies and other times of need. As a non-profit organization, MedicAlert Foundation is governed by a volunteer board of directors, comprised of highly respected national leaders from the healthcare profession and business. MediAlert jewelry is supported by a 24/7 call center which claims to have access to the users medical records. I am unaware of ever providing MedicAlert with medical information on any of my patients, so I assume the information that they have available is provided by the patient themselves, and may or may not be accurate and up to date. Actually, one has to be concerned whether the patient information on any medical ID jewelry is up to date and accurate. If it’s not accurate, it could potentially confuse care providers and lead to more errors in care. Given the potential downsides of medical ID jewelry, is there any evidence that it saves any lives, let alone millions? There are, of course, anecdotes. And these dramatic stories help propel sales of millions of bracelets and necklaces. Lauren’s Hope is a Missouri company which a heart-warming story of its genesis: Lauren, a teenager with type I diabetes did not want to wear her medical ID bracelet because it wasn’t stylish. A new interchangeable bracelet was created. The compelling argument for a Type I diabetic to wear a Medical ID bracelet is that if they become confused or unresponsive from hypoglycemia, a paramedic or bystander can immediately recognize the situation, give glucose and save a life. The problem with this seemingly apparent benefit is that the paramedic should not assume an unresponsive person who is a diabetic is hypoglycemic; other causes should be considered and evaluated. Likewise, hypoglycemia should be considered and tested for in an unresponsive person who is not known to be a diabetic. If you do a Google search asking the question “Do Medical ID’s Save Lives?” the vast majority of search results are various links to Medical ID company websites. I was unable to find any scholarly article which addressed the question of lives saved by medical ID jewelry, but I found one 2017 British paper which questioned the benefits after a review of the scanty literature on the topic. From a cardiac standpoint, the relevant conditions are 1) the one medical implant they mention-an ICD (implantable cardiovert-defibrillator) 2) prosthetic heart valves, and 3) anticoagulants. I have to say that in my 30 years of practicing cardiology I have never advised a patient with one of these conditions to wear a Medical Alert ID. The same considerations I mentioned for the unresponsive diabetic applies to these cardiac conditions. For example, some patients with pacemakers or ICDs should not get MRIs. If an MRI is indicated on a patient that cannot give a history, it is the responsibility of the radiologists and technicians to make sure that the patient has not had an implant that would put them at risk. Thus, a careful search of the body for signs of surgery is warranted, with a standard Xray if an implant is suspected (see here). The striking result of our literature review is that there is an implicit assumption that medical IDs work, and themselves lead to minimal harm. Our commercial review revealed that these products are readily available for purchase from several companies, with no mandatory governance or minimum standards to ensure the accuracy or appropriateness of the information provided. The UK headquarters of MedicAlert Foundation has provided support for > 300,000 members (www.medicalert.org.uk/about-us/our-history); worldwide, this number rises to millions (www.medicalert.org/about/who-we-are/history). Membership with MedicAlert Foundation includes the checking of medical content displayed on the jewellery for appropriateness by a team of registered nurses (although it is unclear in which jurisdiction these nurses should be registered). The information provided to them is reliant on patient self‐reporting with no required input from the patient’s physician or access to their medical records.
. Bojah et al. describe an ‘allergy to anaesthesia’ inpatient wristband, that demonstrates how reliance on patient self‐reporting has the potential to cause dilemmas at a time when patients may be unable to elaborate 19. In an unregulated environment, mistakes or confusion of drug intolerances with allergies could mislead. For example, in the context of antimicrobial therapy, ~ 10% of the general population in the UK claim to have a penicillin allergy; however, only < 1% truly have an adverse immunological drug reaction 20. Many patients could thus be denied the most effective treatment for their infection through a misunderstanding. The current validity of information on ID bracelets is also questionable; no company requires physician input into the wording on medical alert devices, although some recommend consultation with the primary care physician or healthcare provider for advice on what information to have engraved 21. Some companies advise a non‐mandatory (and chargeable) yearly update of information 3. 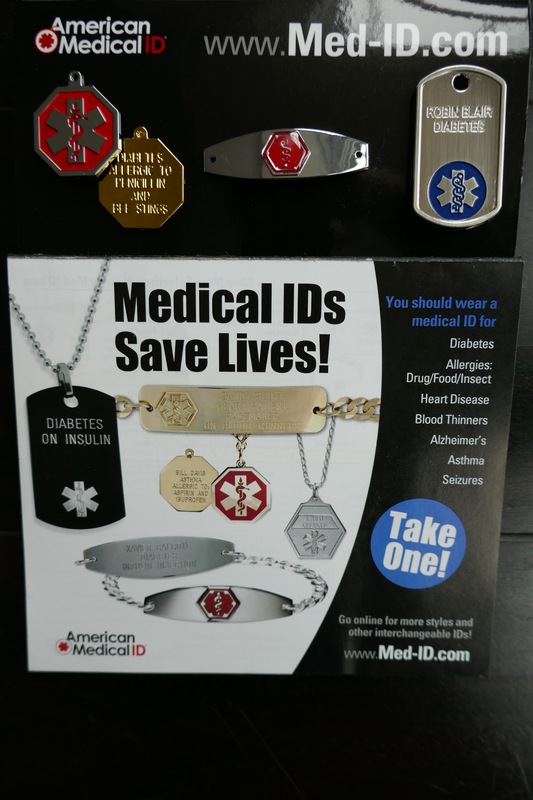 There is no evidence that Medical ID jewelry saves lives. The information on Medical ID jewelry is patient determined, and may or may not be accurate or up to date. The medical ID industry is totally unregulated. Government should institute minimum standards to ensure the accuracy or appropriateness of the information provided. I’m interested in readers’ experience with medical IDs, good and bad, so please feel free to share your anecdotes. Has your life been saved by a medical ID? What information is on your medical ID? 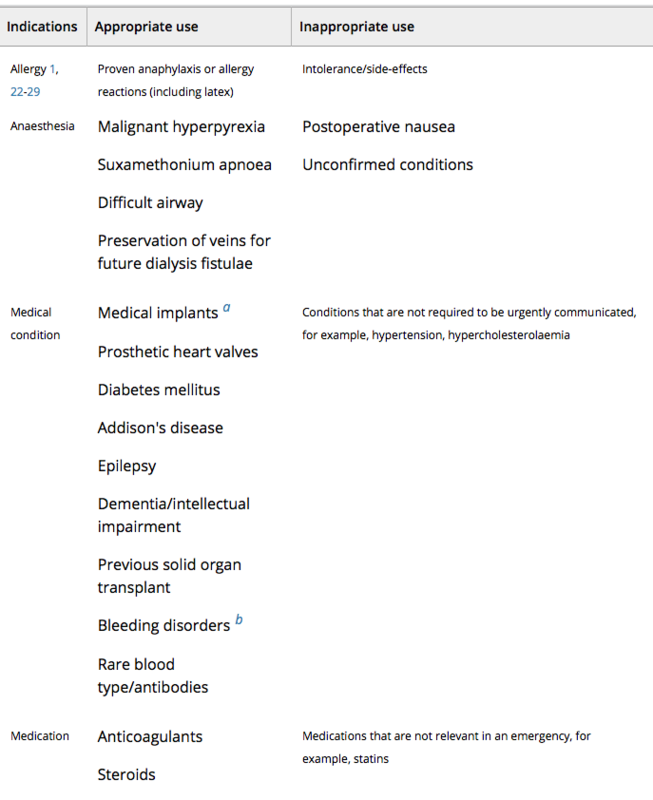 Any adverse experiences with medical ID? N.B. In the course of this investigation I realized that my iPhone has a “medical ID” function that can be activated when the phone is locked and will display relevant medical information. 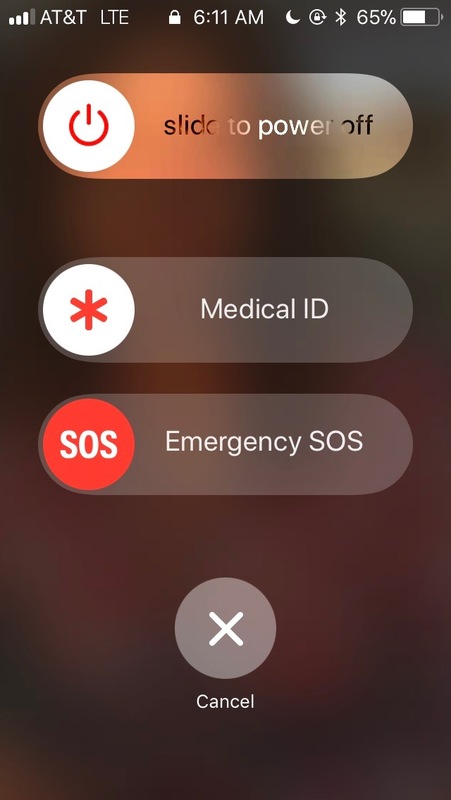 I added information with my emergency contacts, my medications and a few of my illnesses (including hyperskepticism) into the Medical ID section of the Apple Health app. So, if you find me lying on the side of the road, look for my cell phone, push the two buttons on either side, wait a few seconds for the below screen, and perhaps you can save my life! Physicians who don’t meet MU criteria will be penalized by reduced reimbursement. The criteria for MU are arcane and confusing and very few busy clinicians have the time or interest to study them in detail. I’ll cite two examples which represent only the tip of the MU iceberg: patient education and BMI counseling. In order to satisfy this measure, my office staff have been instructed to print out allegedly educational information on one of the diagnoses the patient carries and hand the print out to every patient that is seen. The information comes from a patient education database that is connected to our EHR and I have not had the time or interest to review whether it is correct or helpful. I get no sense that this is helping my patients in any way but I know that more trees are being uselessly sacrificed on a daily basis because of this MU requirement. I spend time talking with all my patients about the importance of regular aerobic exercise and a healthy diet and I provide them with my recommendations through this blog. With all the time, money, paper and energy that has been spent on meeting these MU criteria, I don’t think my patients have been helped and now according to a tweet from an official with CMS, meaningful use may be ending. “In 2016, MU (meaningful use) as it has existed — with MACRA — will now be effectively over and replaced with something better,” tweeted Andy Slavitt, the administrator of the Centers for Medicare & Medicaid Services (CMS). I’m happy these onerous requirements may be ending but fearful of what meaningless requirements may follow. 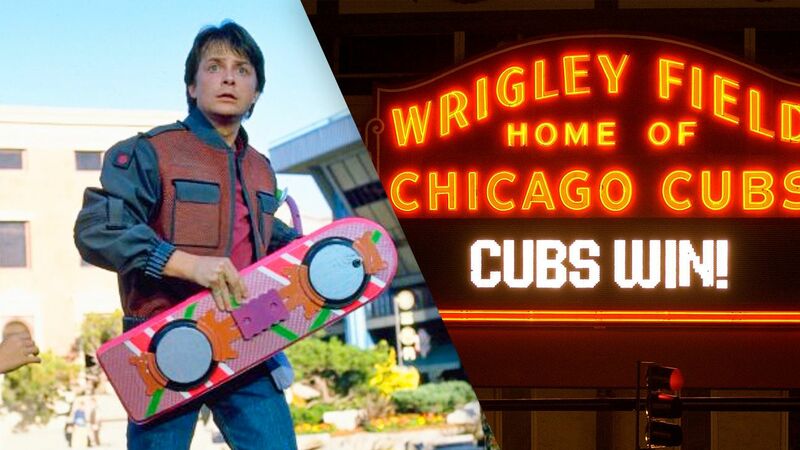 I love the fact that I can leave the hospital after seeing a consult and drive home and create the note on that patient while watching the Cardinals play the Cubs in game four of the NLDS (I abhor the outcome of said game). I love the fact that if I’m on call quietly eating breakfast at home and Mrs. Jones calls who is a patient of my partner Dr. B I can within a minute pull up her entire chart. In this chart I can see a tiny picture of her and I can see all of the medication she’s on, all of the recent tests she’s had, and all the thoughts and diagnoses that my partner has conferred upon her. If I did not have this information I would have to spend a super long time trying to extract it from her and extracting information from a patient on their medications, diagnoses and previous testing is a wildly variable (and often frustrating ) experience. Said frustration is exponentially increased when the phone conversation occurs in the middle of a seemingly crucial sports event or a delightful meal. I love the fact that once I’ve talked to the patient I can very easily electronically send in a prescription for a medication she needs to her local pharmacy without having to pick up a phone and go through a series of answering machine loops at the pharmacy.and after doing that I can leave a nice concise note for my partner in the EMR which he can read when he comes in on Monday (or if he checks his laptop from home he can see it instantaneously). Most of what I abhor about my EMR is not the fault of my EMR. Most of this comes from what is called meaningful use. Since the government has more or less forced us physicians into using EMR it needs ways to prove that we are using it effectively. Early on what they wanted to see was that we were using electronic prescriptions. This actually turned out to be a good thing because electronic prescriptions are awesome and now nobody has to see my illegible scrawl on a piece of paper and try to decipher what medication it is I want Mrs. Jones on. But now meaningful use has moved beyond electronic prescriptions and into less clearly beneficial areas. For example it is very crucial now that we have an electronic patient portal for all of our patients. Imagine if you will that Mrs. Jones is 85 years old and hasn’t the foggiest idea of how to set up an account over the Internet. It is not going to be easy to get Mrs. Jones to communicate back to you. In an effort to bolster the percentage of my patients that are communicating back to me by the patient portal I take up (what are arguably) critical minutes during the office visit trying to explain it to them and encouraging them to communicate by the portal. I usually take this opportunity during the office visit to introduce them to my posts here on The Skeptical Cardiologist. Mrs. Jones often believes that The Skeptical Cardiologist and the practice patient portal are one and the same but they are totally separate entities. I have to say that when we have gotten patients to communicate back to us through the patient portal on their questions or their blood pressure reading and to give them results through the patient portal it has been really nice. it’s possible, but by then there will be more meaningless use requirements that I will feel compelled to rant against.